Purpose: Manual toothbrushes (MTBs) and power toothbrushes (PTBs) are effective oral physiotherapy aids for plaque removal. End-rounded bristles are safer and reduce damage to oral tissues. Nylon bristles are more effective in plaque removal because the bristle is stiffer than natural bristles. In the last 10 years the number of options for MTBs and PTBs has expanded significantly and there is very little information providing a reference frame for the design characteristics of the heads. The present in vitro study characterized a variety of MTB and PTB heads to provide a reference library for other research comparisons which might be made. Methods: Various commercial MTB and PTB heads were used to characterize the following: bristle size, shape, diameter, number of tufts, number of bristles per tuft and surface characteristics. Photographs were collected from the side, at 45 degrees and the top of each toothbrush (TB) head using a scanning electron microscope and digital camera. Images were analyzed (Soft Imaging System) for bristle features and designs. One-way ANOVA (p≤0.05) was performed to detect differences among TB types within MTB and PTB groups and between pooled values for MTB and PTB groups. Results: There were significant differences (p≤0.05) in toothbrush bristle diameter and bristle shape. In contrast, there were no significant differences between PTB vs. MTB in regards to bristle diameter, bristle count and tuft count. Conclusion: The results suggest that although there are wide variations in toothbrush head designs, significant differences were found only in relation to bristle diameter and shape. The first power toothbrush (PTB) was developed in Switzerland in 1939. This brush had a power cord and was introduced in the U.S. in the 1960s.4 Contemporary PTBs were rediscovered in the 1980s, and today you can find various types of PTBs on the market that utilize varied mechanisms of action (rotational oscillation, sonic, ultrasonic) and power supplies (battery powered or rechargeable).3,5,6 PTBs also offer an array of brush head designs. 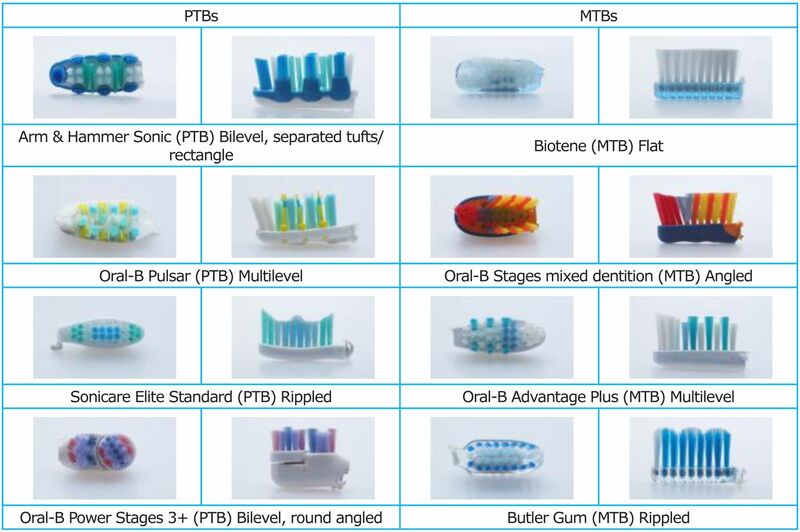 Various studies have examined TB bristles in regards to bristle end-rounding, methods for predicting the quality of nylon 612 filament for use as a bristle material,20 filament round-ending quality in electric toothbrushes21 and comparisons of the end-rounding of nylon bristles in commercial toothbrushes.22-24 Studies involving end-rounding of bristles have established the need for rounding the end of the bristle to protect the tissues of the oral cavity from damage caused by tooth brushing.24-27 The studies conducted regarding evaluation of TB bristles have either analyzed MTBs compared to other MTBs22,28 or PTBs compared to other PTBs,21 and no current studies have analyzed or compared MTBs and PTBs to each other. The purpose of this preliminary study is to analyze a broad spectrum of commercially available MTB and PTB heads to compare characteristics known to contribute to their safety and efficacy, such as number of tufts, number of bristles per tuft, bristle diameter, bristle shape and surface characteristics of the bristles. A total of 24 MTB and 21 PTB heads commercially available in the U.S. in 2009 were analyzed. The TBs had either soft or extra soft bristles (Tables I, II). Prior to analysis, the TB heads were removed from the handle using a Dremel 3000 series (Dremel, Racine, Ill.) with a 426 Dremel reinforced cut-off wheel. During the removal process, the TB handle was secured in a vice with the brush head face down to reduce handle residue particles getting onto the bristles. The brush heads were individually packaged in small coin sized Ziplock bags (2x3 2 MIL bags) and labeled with the name of brush, date cut and whether the head was a MTB or a PTB. Photographs were taken of each TB head and included in the tables listing the brushes used in this study (Tables I, II). Digital photos were taken of each side and top of the TB head. The number of tufts per TB head was counted using the top view digital photo of each TB head as depicted in Figure 1. The TB heads were then sputter coated with Au-Pd and inspected and documented in the scanning electron microscope (SEM) at 200x top view for bristle diameter, 15x top view for tuft counts and 40x and 200x horizontal views for surface characteristics. The SEM images were analyzed with the software Soft Imaging System GmbH (Soft Imaging System Corp., Lakewood, Colo.) to measure diameter and count bristles per tufts (Figure 3). The diameter of each bristle was measured by using the circle measurement tool. Three bristles were measured using the 200x SEM top view and averaged for the diameter of the bristles for each TB head. If a TB head had various types of bristles, then each bristle type area had a 200x SEM top view photo taken and analyzed for the various bristles diameters. The bristles per tuft were counted by using Soft Imaging System touch count tool using the 15x SEM top view photo (Figure 3). Three tufts were counted within each 15x SEM photo, and then averaged for the typical amount of bristles per tuft. The surface characteristics were noted using the 40x and 200x SEM horizontal photos. 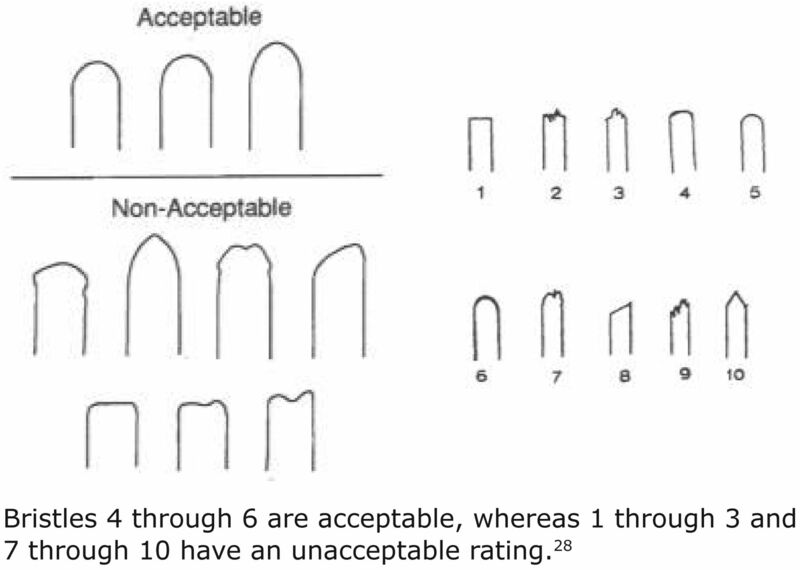 When reviewing the surface characteristics, the bristle ends were analyzed for acceptable or unacceptable end-rounding using Silverstone and Featherstone scale (Figure 4).29 The Adrians Grading Scale was used to categorize the bristle shape.30 In addition, the bristles were also characterized as to roughness of the lateral surfaces. Descriptive statistics for different TBs on tuft count, bristle count and bristle diameter are shown in Table III. Data analysis was performed with SAS (Statistical Analysis System, version 9.1.3; SAS Inc., Cary, NC). A 2 group t-test was used to compare the difference between MTB and PTB on bristle count, tuft count and bristle diameter. A 1-way analysis of variance (ANOVA) and Ryan-Einot-Gabriel-Welsch Q (REGWQ) multiple comparison post-hoc analysis were utilized to compare the diameter of TB bristles based on an unbalanced dataset. Level of significance was set at ɑ=0.05. The average bristle diameter, average number of bristles per brush head and exact number of tufts per brush head for MTBs and PTBs are reported in Table III. There were no significant differences (p>0.05) in the mean bristle diameter, bristle count nor tuft counts between MTBs and PTBs (Table IV). Table V reports the surface characteristics of TB heads and shapes of bristles. Oral-B Sonic (Procter & Gamble Company, Cincinnati, OH) revealed spiral bristles. Butler Gum (Sunstar Americas, Inc., Chicago, Ill.) middle section of bristles split into 4 and shredded. Crest Dual Action Clean (Procter & Gamble Company, Cincinnati, OH) has small bristles in the middle of the brush head and large bristle tips on the outside. Butler Gum Summit bristles appear spongy and some appear as an upside down cone and cut off. Oral-B Pulsar (Procter & Gamble Company, Cincinnati, OH) has a rubber bristle. Sonicare Kids PTB (Philips Electronics North America Corporation, Andover, Mass.) had a design with every other bristle on the periphery of the brush head small and all the middle section of the brush head small. Bristle diameters, number of tufts and number of bristles among the MTB and PTB were not significantly different among types (p>0.05). For MTB, there was no significant difference (p>0.05) between flat tip with straight rims and pointed tip, but there were significant differences (p≤0.05) in diameter between round tip, flat tip with round rim and mushroom-shaped bristles. There was no significant difference in bristle diameter among different bristle shapes for PTB. Within each bristle shape, there was no significant difference in diameter between MTBs and PTBs (Table VI). SEM of bristles of TBs that had multiple types of bristle sizes are shown in Table VII. The Arm and Hammer Spinbrushes (Church & Dwight Co., Inc., Princeton, NJ) revealed diamond shaped bristles along with the end-rounded bristles. Butler Gum toothbrush contained bristles that appear to be split into fours. Oral-B brushes had differences in terms of shape of bristles and texture. The Oral-B Pulsar had 3 types of bristles. Crest Dual Action Clean revealed texture differences and various bristle types. There was quite a range of bristle end shapes and numbers among the range of MTB and PTBs examined. Comments are divided into discussion of limitations of the present study, interpretation of the results, comparison of results to published information, clinical interpretation of the meaning of the results and suggestions for future research. In the current study, brush heads were analyzed intact. Previous studies in the literature separated the bristles or tufts from the heads to be analyzed with the SEM.32 The current study chose this path to avoid damaging or distorting the dimensions of the bristles. The results revealed no significance (p>0.05) between the MTB vs. PTB regarding the bristle diameter, bristle count and tuft count. However, there was a significance difference (p≤0.05) noted regarding the bristle diameters and bristle shape. The significance was found between flat tip with straight rims bristles (118μ) and round tip bristles (158μ), pointed tip shaped bristles (113μ) and round tip bristles (158μ), mushroom shaped bristles (177μ) and flat tip with straight rims bristles (118μ), and mushroom shaped bristles (177μ) and pointed tip bristles (113μ). The typical ranges for TB bristle diameter are 150μ to 400μ in diameter.5 It appears that the TB bristles that are not the typical rounded tip has either a greater diameter (mushroom shaped) or decreased diameter than normal range (flat tip with straight rim bristles or pointed tip bristles). This suggests that the shape of the bristle had an influence on the diameter of the bristle. The pointed bristles diameter and flat tip with straight rims bristles diameter were not within the typical diameters of TB bristles. Though there is evidence of the importance of end rounded TBsm,32 inconsistent end-rounding of TB bristles was demonstrated in previous MTB studies.28-30,35 A study regarding PTB bristles revealed when evaluating the bristle shapes that a good quality of filament tips could be found for most of the products.21 Former studies of Oral-B22,24,29,36-38 found some bristles were not acceptable among the tufts, where Colgate22,29,36,37 were evaluated inconsistently, which would suggest a great variance in end-rounding quality. Butler showed a high number of not acceptable filaments in former studies22,24,27,36,39 which were confirmed in the study by Meyer-Lueckel.21 The first study to analyze PTB bristles concluded that most of the brands (13 out of 15) examined among the PTBs were of an acceptable quality,21 and this study concluded the same (9 PTB out of 21 and 9 MTB out of 24). Overall brush head design is important for both cleaning efficacy and safety.11,13,15,17,18,40 The design needs to be considered when determining which TB to utilize or recommend. Since there were no differences in design for certain parameters for the TBs analyzed in the current study, one could determine that if a new brush came out with similar design that one could predict it would have similar characteristics. There was a significant difference (p≤0.05) in bristle diameters and bristle shape among the MTBs. No significant difference (p>0.05) among the PTBs for bristle diameter and bristle shape. No significant differences (p>0.05) between MTB vs. PTB bristles count and diameters among the various manufacturers. There were no significant differences (p>0.05) in the tuft counts between MTB vs. PTB. Thanks to Philips Sonicare, Oral-B, Waterpik, Biotene, Colgate and Sunstar Butler for the donation of the toothbrushes. Marsha A. Voelker, CDA, RDH, MS, is an Assistant Professor Division of Dental Hygiene University of Missouri-Kansas City School of Dentistry. Stephen C. Bayne, MS, PhD, FADM, is a Professor and Chair of Cariology, Restorative Sciences, and Endodontics University of Michigan School of Dentistry. Ying Liu, PhD, is a Clinical Assistant Professor, Research & Graduate Programs, University of Missouri-Kansas City School of Dentistry. Mary P. Walker, DDS, PhD, is a Professor and Associate Dean for Research and Graduate Programs University of Missouri-Kansas City School of Dentistry.
. The development of the toothbrush. A short history of tooth cleansing. Part 1. Dent Health (London). 1982;21(4):25-7.
. Toothbrush technology--even the Pharoahs brushed their teeth. J Dent Technol. 2000;17(4):26-27.
. Primary Preventive Dentistry. 7ed. New Jersey: Pearson; 2009.
. Power toothbrushes: a critical review. Int J Dent Hyg. 2004;2(1):40-44.
. Dental Hygiene Theory and Practice. 3ed. St. Louis: Saunders Elsevier; 2010.
. Clinical Practice of the Dental Hygienist. 10ed. Baltimore: Lippincott Williams & Wilkins; 2009.
. Plaque removal efficacy of a novel manual toothbrush with MicroPulse bristles and an advanced split-head design. J Clin Dent. 2007;18(2):49-54.
. Laboratory interproximal access efficacy and gingival margin cleaning of the elmex sensitive soft, extra soft and ADA reference toothbrushes. J Clin Dent. 2007;18(1):25-28.
. Clinical comparison of the plaque removal efficacy of a manual toothbrush with criss-cross bristle design. Am J Dent. 2009;22(4):200-202.
. Interproximal access efficacy of three manual toothbrushes with extended, x-angled or flat multitufted bristles. Int J Dent Hyg. 2010;8(3):244-248.
. The impact of powered and manual toothbrushing on incipient gingival recession. J Clin Periodontol. 2009;36(11):950-957.
. Number, length and end-rounding quality of bristles in manual child and adult toothbrushes. Int J Paediatr Dent. 2011;21(3):232-239.
. The Oral-B CrossAction manual toothbrush: a 5-year literature review. J Can Dent Assoc. 2006;72(4):323.
. In vitro tooth cleaning efficacy of manual toothbrushes around brackets. Eur J Orthod. 2009;31(1):103-107.
. Safety and efficacy of two manual toothbrushes. Int J Dent Hyg. 2010;8(4):280-285.
. Cleaning efficacy and soft tissue trauma after use of manual toothbrushes with different bristle stiffness. J Periodontol. 2011;82(2):267-271.
. Benefit of the power component of sonic and rotation-oscillation modes of action for plaque removal using power toothbrushes. Am J Dent. 2010;23(2):60-64.
. Different powered toothbrushes for plaque control and gingival health. Cochrane Database Syst Rev. 2010;(12):CD004971.
. Methods for predicting the quality of nylon 612 filament for use as a bristle material. J Applied Polymer Science. 1992;46:1369-1374.
. Filament end-rounding quality in electric toothbrushes. J Clin Periodontol. 2005;32(1):29-32.
. Bristle end-rounding in children's toothbrushes: a comparative study. J Clin Dent. 1993;4(2):61-66.
. A comparative evaluation of the in vitro penetration performance of the improved Crest complete toothbrush versus the Current Crest complete toothbrush, the Colgate Precision toothbrush and the Oral-B P40 toothbrush. J Clin Dent. 1996;7(1):21-25.
. A comparative evaluation of the percent acceptable end-rounded bristles: Butler G.U.M., Colgate Plus, Crest Complete, and Reach. J Clin Dent. 1994;5(2):38-45.
. The optimum characteristics of toothbrushes for personal oral hygiene. Dent Items Interest. 1948;70(7):697-718.
. The measurement of the effect of toothbrushes on soft tissue abrasion. J Dent Res. 1977;56(7):722-727.
. A comparative evaluation of the percent acceptable end-rounded bristles in the crest complete, the improved crest complete, and the oral-b advantage toothbrush. J Clin Dent. 1994;5:38-45.
. A comparison of the end-rounding of nylon bristles in commercial toothbrushes: Crest Complete and Oral-B. J Clin Dent. 1992;3(2):47-50.
. Examination of the end rounding pattern of toothbrush bristles using scanning electron microscopy: a comparison of eight toothbrush types. Gerodontics. 1988;4(2):45-62.
. A morphologic and SEM investigation of 58 toothbrushes. Clin Prev Dent. 1985;7(5):8-16.
. Bristle end-rounding in toothbrushes: a comparison of different evaluation techniques, bristle position and viewing angle. J Clin Dent. 2004;15(1):22-27.
. A review of current toothbrush bristle endo-rounding studies. Compend Contin Educ Dent. 1995;16(7):694.
. The mechanical effect of various types of tooth brushes on the alveolar mucosa and the gingiva (scanning electron microscopic studies). Dtsch Zahnarztl Z. 1978;33(1):14-20.
. Gingival abrasion and plaque removal with manual versus electric toothbrushing. J Clin Periodontol. 1986;13(7):709-713.
. Characteristics of toothbrushes. Aust Dent J. 1983;28(4):202-211.
. Bristle anchoring and bristle end-rounding in adults' toothbrushes. Schweiz Monatsschr Zahnmed. 1992;102(1):38-46.
. Bristle end rounding of manual toothbrushes and reproducibility of end rounding classification. Am J Dent. 2003;16(5):299-304.
. Bristle end-rounding and anchoring quality in brand-new and used adult's toothbrushes. Deutsche Zahnarztliche Zeitung. 1995;50:517-524.
. Toothbrush filaments end-rounding: stereomicroscope analysis. J Clin Periodontol. 2001;28(4):360-364.
. Safety of oscillating-rotating powered brushes compared to manual toothbrushes: a systematic review. J Periodontol. 2011;82(1):5-24.